Benjamins Estate Agents are pleased to bring to the market this beautifully presented three double bedroom detached house. The property is in the sought after South Nottingham village location of Keyworth on Thelda Avenue. The accommodation comprises; Entrance Porch, Entrance Hallway, Living Room with large patio doors opening onto rear garden, Kitchen/Diner, Downstairs WC, Utility Room, Three Double Bedrooms and a family bathroom with bath and shower cubicle, garage & off road parking. Benefits from Porcelain tiled flooring and solid oak doors. 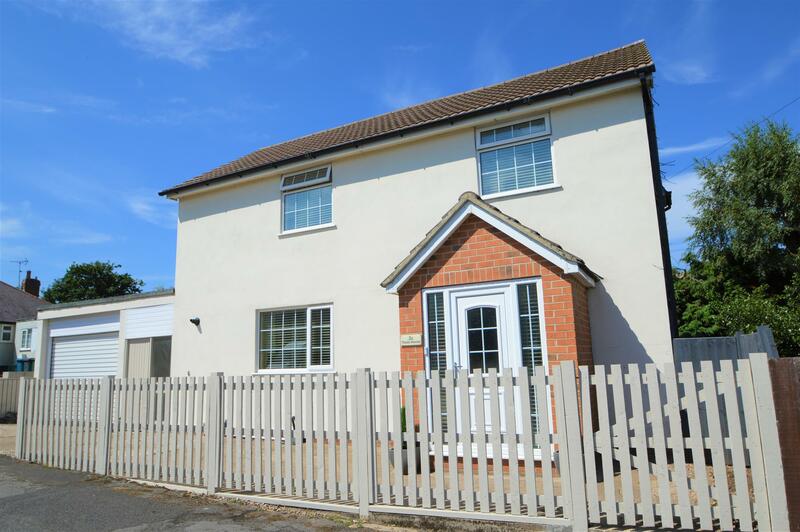 There is driveway leading to the garage and a landscaped rear garden with paved patio. UPVC double glazed door and window to the front aspect, Cream porcelain tiled flooring, continues throughout the Entrance Hall. Space for coats and shoes, spotlight to the ceiling. Tiled flooring continued from the Entrance Porch. Radiator. Under stair cupboard. Doors to the Living Room, downstairs WC & Kitchen/Diner. Tiled flooring. Frosted UPVC double glazed window to the side aspect. Wall mounted wash hand basin and Low level WC. Large UPVC double glazed patio doors opening onto the rear garden. Marble fireplace and hearth with inset real flame gas fire and wooden mantelpiece. Radiator, carpet, ceiling light fitting & wall lights. Kitchen fitted with a range of wall and base units with solid wood worktops over. Tiled splash backs, tiled flooring and inset stainless steel one and a half bowl sink unit, radiator, ceiling spotlights. Appliances to include; integrated fridge/freezer, dishwasher, electric oven, extractor and gas hob. UPVC double glazed window to the front aspect and French doors to the rear elevation. Door to the Utility room. Wall mounted gas combination boiler. Plumbing for washing machine. Space for tumble dryer. Wooden work surfaces with tiled splash back & tiled flooring UPVC double glazed door opening onto open porch area that has a flat roof and gives access to the garage and the rear garden. There is double glazed door that opens onto the front of the property. Doors to the three bedrooms and the family bathroom. Access to loft via hatch. UPVC double glazed window to the rear aspect. Built-in wardrobes. Radiator, carpet & ceiling light fitting. UPVC double glazed dual aspect window to the side and rear, radiator, carpet & ceiling light fitting. UPVC double glazed window to the front aspect. radiator, carpet & ceiling light fitting. Modern four piece suite comprising; Bath, Toilet, Pedestal wash hand basin and shower cubicle which has tiled splash back and mains shower with raindrop head and separate attachment. Chrome towel radiator tiled flooring. Spotlights to the ceiling. Frosted UPVC double glazed window to the rear aspect. Roller shutter door, light & power, door to the rear garden. The rear garden is low maintenance with paved paths & grass area. There is an outside tap, door into garage & door to the front of the property.